Daniel Morris is our principal euphonium. Woodhouse is his first brass band and he’s been with us for six years [seems like longer!]. Daniel turned 16 in 2016 and is one of our more experienced players. Last year Dan was awarded a Diploma from the London College of Music so he’s officially Daniel Morris DipLCM. He’s spent two years (including one as principal) with the National Children’s Brass Band of Great Britain, plays with Derbyshire County Wind Band and is second euphonium at Chapeltown Band who compete in the Championship Section. When not playing euphonium (or trombone), he’s either busy at school or indulging in a bit of on-line gaming. He’s also just taken up the bassoon. Yes… the bassoon. 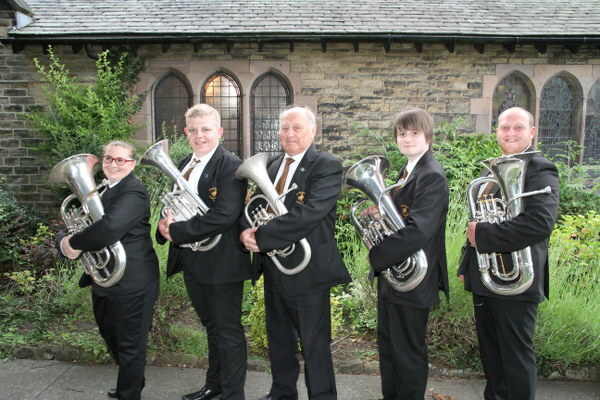 Daniel’s joined on euphonium by Nathan Whittaker and also Kate Stark who has recently moved to the area. Kate is currently on maternity leave having had a baby boy. Benjamin in February and we look foward to having her back playing again.